Register before April 15 for the Three Societies Meeting in order to take advantage of the early bird rates. This gathering of the British Society for the History of Science, the Canadian Society for the History and Philosophy of Science and the History of Science Society brings together historians of science every four years for a major international conference. 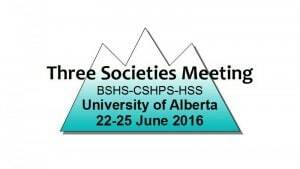 This conference will take place June 22-25, 2016, at the University of Alberta in Edmonton, Alberta, Canada. We are excited to welcome you to Edmonton, capital of the Province of Alberta and one of Canada’s major cities. June is an ideal time to visit Edmonton, one of the sunniest places in Canada, with over 17 hours of daylight at the summer solstice and average temperatures of 22C/72F. Edmonton is also known as a Festival City – during June we have The Works Art and Design Festival (June 17-29), The Edmonton International Jazz Festival (June 17-26), and Free Will Players (Shakespeare in the park – Romeo and Juliet and Love’s Labour’s Lost - June 21–July 17). We have an exciting program taking shape. There are a wide range of affordable housing options, and lots of time to meet your fellow historians of science in a relaxed atmosphere. We are planning a wonderful reception in our newly renovated Art Gallery (exhibitions planned include 7: Professional Native Indian Artists Inc. and Unvarnished Truth: exploring the material history of painting). And a great final banquet – and we promise no speeches! You can access the special conference rates for the hotels both before and after the conference (from June 19-27), in case you want to do a bit more exploring. We will also provide you with links to make your own arrangements for other travel in the area such as: to the Rocky Mountains and Jasper, Banff, Lake Louise or the Columbia Icefields; to the Alberta Badlands and Royal Tyrrell Dinosaur Museum; or to the Oil Sands in Fort McMurray.